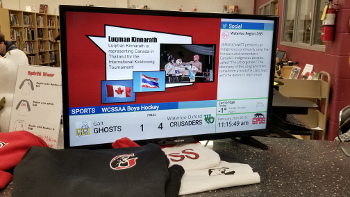 CAMBRIDGE, Ontario — March 20, 2019 — Bannister Lake today announced the implementation of a digital signage pilot project with the Waterloo Region District School Board in Southern Ontario. The project consists of a networked digital signage solution in 16 regional high schools located about an hour west of Toronto. The project is powered by Bannister Lake’s Chameleon data aggregation and management product. Chameleon captures data from a wide variety of incoming sources and allows student, faculty, and staff network operators to moderate, edit, schedule, and distribute content to various displays. Bannister Lake is a leading provider of professional video graphic display solutions for broadcast television, cable, satellite, audio/visual, and information presentation applications, eSports, and digital signage worldwide. The company’s solutions integrate seamlessly with existing infrastructures while automating the integration and display of external data sources, improving the productivity of any organization. Visit Bannister Lake online at www.bannisterlake.com. Caption: Bannister Lake’s Chameleon data aggregation and management solution powers the Waterloo Region District School Board digital signage network across 16 regional high schools located west of Toronto.